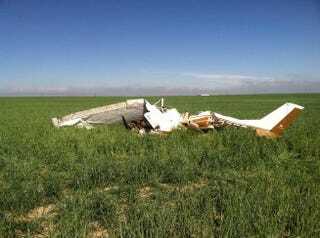 The Denver Post reports that National Transportation Safety Board investigators suspect that the crash of a Cessna 150 last May, operating under instrument flight rules, was partially caused by the pilot taking selfies. Investigators also found a GoPro camera containing video files of several previous flights. "Post-accident examination of the airplane did not reveal any pre-impact anomalies that would have precluded normal operation," the NTSB said in their report, released Friday. "Based on the wreckage distribution, which was consistent with a high-speed impact, and the degraded visual reference conditions, it is likely that the pilot experienced spatial disorientation and lost control of the airplane." Investigators found that the plane's crash was likely caused by an aerodynamic stall and "subsequent spin into terrain." "It is likely that cell phone use during the accident flight distracted the pilot and contributed to the development of spatial disorientation and subsequent loss of control," the report says.